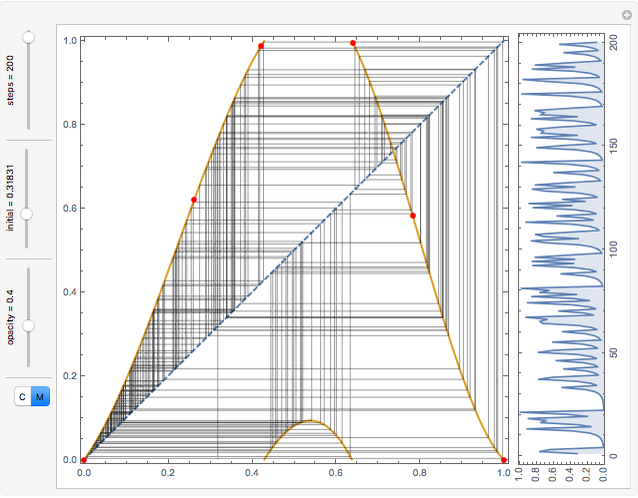 The logistic map is probably the most famous and simplest example of a function from the unit interval onto itself that produces chaotic behavior. Images of its time series and cobweb diagrams are iconic to many introductory textbooks on nonlinear dynamics. This Demonstration lets you vary an interpolating function by dragging 2D control points to construct arbitrarily shaped maps from the unit interval to itself. Some of these functions generate chaos and others do not. By interactively changing the curve, you can learn intuitively what shapes lead to the celebrated period doubling and chaotic behavior. The cobweb diagrams and time series adjust accordingly and instantly. You can find many interesting scenarios that show the interplay between multiple repellers and attractors, including some intermittence and state-switching behavior. See snapshots and bookmarks for sample settings. 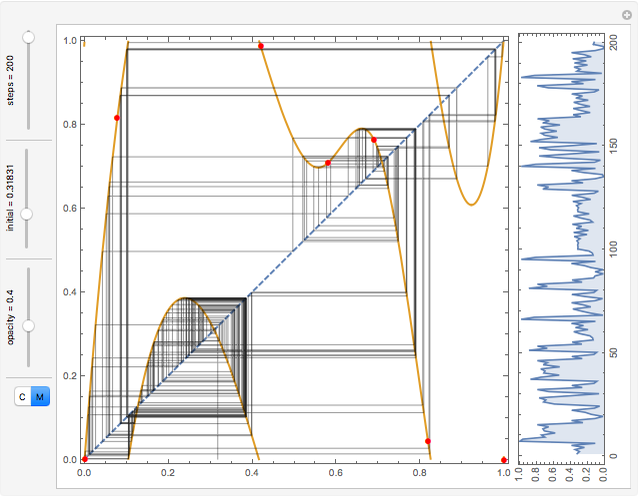 The time direction is upward in the time series plot. Please avoid placing a control point immediately above another; in such a case there is no interpolating function, so the program slightly resets the points. 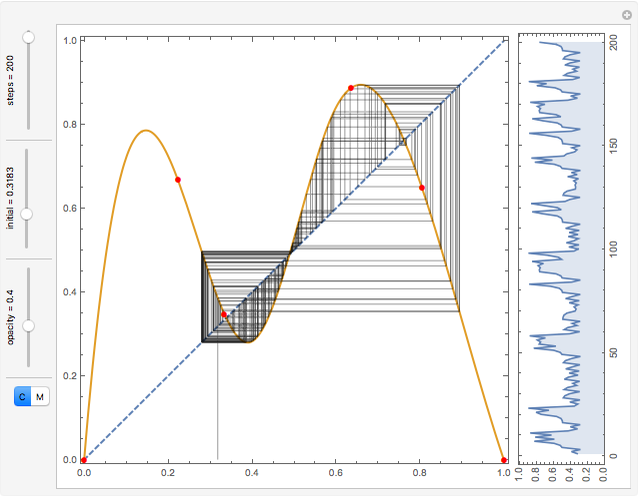 You can choose either of two modes to clip when the interpolation function plot goes outside the unit interval range. The first is basic clipping (button "C") and the second is modular clipping (button "M"). Vitaliy Kaurov "Time Series and Cobwebs for Arbitrary Recursive Maps on the Unit Interval"